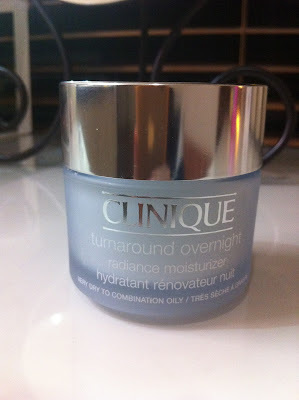 Clinique Turnaround Overnight Radiance Moisturiser | Miss Monique D.
I have another review for you guys. This is something i have been using for just shy of 5 months now and as you can probably guess by the title its the Clinique Turnaround Overnight Moisturiser. 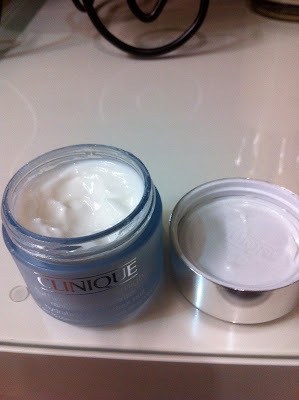 Unlike the Turnaround serum i absolutely LOVE LOVE LOVE this moisturiser! I received a 5ml sample in the december australian glossybox (i think?) and thought it was amazing... until i found out the price of the full size :s $90!?! for 50mls. Much more than i have ever been willing to pay for a night moisturiser. Unfortunately for my wallet, and unlike other night moisturisers i have tried, this one worked perfectly with my very dry combination skin and didn't break me out! which is a first for a night moisturiser. This moisturiser has a creamy consistency with a light, clean, smell (smells like plain cream to me, which is good for sensitive skin) that is recommended for Very dry to Combination Oily skin. I apply it at night, straight after washing my face and toning, by placing five even dots of both my cheeks, forehead, chin and nose then massaging into my face. The non-greasy formula sinks straight into my skin leaving it super soft to the touch. When I wake up in the morning my face does feel more moisturised and slightly more radiant, opposed to when i forget to use it the night before. I think product has played an amazing role in helping reduce my breakouts, possibly something to do with the fact that it helps moisturise my dehydrated skin properly and also due to the active ingredient salicylic acid which is good for speeding up cell turnover. As you can see by the picture above it seems like i haven't used alot of the product but you really don't need all that much for each application. I have been using that particular jar for 3 months after i finished my 5 ml sample which took 2 months to use up. Realistically $90 for a 50ml jar isn't that bad when it lasts for aaaaages. I was lucky enough to have mum purchase my jar for me duty free which was half the RRP (do that it you can, well worth the save!). Love this product! Compared to other night moisturisers it doesn't make me break out and leaves my skin super soft and moisturised. The 50ml jar is well worth the $90 price tag if it continues to work for me. If you have a nice clinique counter lady you may be able to get a sample before you buy or Clinique often have a gift with purchase (GWP) so if you plan your buy right you may be able to snag a 5ml sample in a GWP of another product.